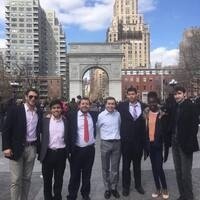 The Model United Nations club will be debating at NYUMUNC X in iconic Greenwich Village hosted by New York University. We will be following a tradition of visiting the United Nations Headquarters and then debating issues of international crime and reenacting the diplomacy of Medieval China. This will be a fun experience to bring the Emmanuel Community to New York and debate with a diverse body of national and international students. Well done! debating is the good idea to target these.